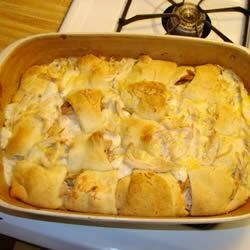 "Hot baked crescent rolls filled with a little chicken and a little cheese. This will bring lots of comfort and cheer to the dinner table!" In a large saucepan heat cream of chicken soup, milk and 4 ounces of the cheese over low heat. Meanwhile, separate crescent rolls into triangles. Place some chicken onto the large end of each roll and top with a little cheese. Roll up and place in a 9x13 inch baking dish. Pour 1/2 of soup mixture directly into the baking dish, not on top of the rolls. Bake at 350 degrees F (175 degrees C) for about 10 to 15 minutes, or until rolls rise slightly and are lightly browned. Pour the remaining 1/2 of the soup mixture into the dish, laying any leftover chicken meat on top, and sprinkle with any remaining cheese. Return to oven until rolls are browned and cheese has melted. I cooked the chicken crescents without the soup mixture and heated the soup mixture on the stove and poured that over the rolls right before we ate them. Wonderful!